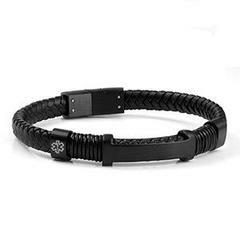 This stylish braided leather and stainless steel medical bracelet is sleek and polished and can be combined with other bracelets to create a unique stacked style. Great for women also. This medical id alert bracelet is all black. Total length is 8.25 inches and should fit wrist sizes 6.5 to about 7.75 inches. Engraving is one line on both front and back with 15 characters per line including spaces.